A Comfy Baby Crib Mattress. The Next Best Thing to a Mother's Arms. The Next Best Thing To A Mother's Arms! Hmmm... a mother's arms - that's a tough act to follow - My nine-month-old makes that clear every time I put her down! Your baby will spend a great deal of time on a baby crib mattress in the first year. Better make sure that when it comes to snuggle time, baby's nice and comfy. The best type of crib mattress for your delicate newborn is a natural one. 'What you can't see won't hurt you', definitely does not hold true when it comes to a crib mattress for your bubbly bundle. The typical synthetic crib mattress contains polyester, which contains chemicals that can cause allergies, skin irritations and asthma. 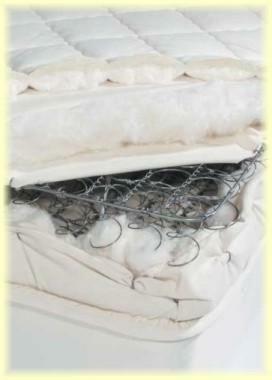 A synthetic crib mattress may also contain polyurethane foam or PVC, which along with polyester are highly combustible. Upon ignition they emit deadly gases and fumes. To prevent this, the mattresses are covered with a fire-resistant and waterproofed synthetic material. As the synthetic crib mattress begins to age, the fire-retardant chemicals react with ordinary household fungi (such as mildew) to create a dangerous chemical reaction. The toxins emitted as these compounds interact are 1000 times more toxic than carbon-monoxide. This toxin release has been indicated as being among the possible causes of SIDS. These fire-retardant chemicals have also been linked to cancer. In contrast, a natural crib mattress is made entirely of natural fibers and materials, and is free from allergens, harmful chemicals and dangerous emissions. Now that's something worth knowing when you're tucking your little one in for the night! The latex crib mattress is composed of natural latex harvested from rubber trees. Latex is naturally anti-microbial, dust mite free and mold-resistant. The rubber is covered in cotton and/or wool which is breathable and will not off-gas any chemicals. Cotton and wool are also natural fire-retardants, negating the need for poisonous flame-retardant chemicals. Latex crib mattresses are usually more expensive than other natural material mattresses, but, since latex is the most durable natural cushioning mattress material available, they are a good investment. The word 'organic' in the context of fibers, refers to the production of cotton, wool and other natural fibers without the use of any chemicals, genetically modified organisms, artificial pesticides or radiation. Made of organic cotton and wool, an organic crib mattress is untouched by synthetic materials, chemicals or harmful allergy-causing compounds during the entire manufacturing process. All washing during the production stage is done with organic soaps. Natural products such as baking soda and silica are used to make the organic crib mattress fire-resistant to meet standards set by government. Babyearth.com has a great selection. Not only is this good for the environment, but it is safe for baby too. 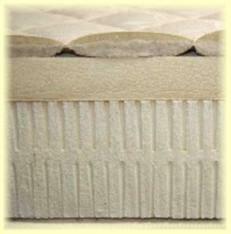 Most durable, natural cushioning mattress material available. Naturally anti-microbial, dust mite free and mold-resistant. Excellent heat regulation, which means a body is kept warm in winter and cool in summer. Excellent moisture regulation. Natural rubber is resistant to moisture buildup. Flexible, yet stable, giving superior comfort. Breaths, maintaining a healthy, balanced temperature. Does not emit deadly gases on ignition. Contains lanolin which prevents dust mites. Absorbs bad odors which are released as soon as you put the natural crib mattress in the sun. The disadvantage of a natural crib mattress is obviously its cost, with Latex being the most expensive. Bear in mind, however, that a natural crib mattress can be re-used for siblings. On the other hand, it is NOT recommended that a synthetic crib mattress be re-used, due to the health hazards associated with aging synthetic mattresses. 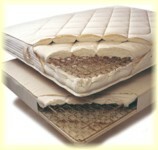 Although latex and organic crib mattresses are not widely available at outlet stores, they are readily available online. Click here for latex or here for organic. If you cannot afford a natural crib mattress, there are two options in the synthetic category. The innerspring crib mattress and the foam crib mattress. The price you will pay for either of these mattresses will vary greatly according to quality. The number of coils in the mattress - the more the better. The gauge of the steel used for the coils and the border rods used to bind the coils. They keep their shape longer than foam crib mattresses. The foam density (not thickness). They are less expensive than innerspring mattresses. They are lighter than innerspring mattresses - therefore, sheet-changing is easier. Check the crib mattress that you are looking at, against the following factors to establish what you are really getting for your money. The crib mattress must be firm. Soft mattresses do not support the baby's growing bones and have been indicated as being among the possible causes of SIDS. To read more about SIDS prevention, click here. An innerspring mattress should have a coil count of at least 150. The higher the coil count, the firmer the mattress. 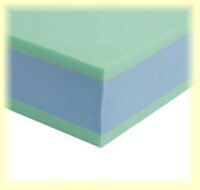 A foam crib mattress should be made of dense foam. The best is approximately 1.5lbs per cubic foot. Unfortunately, this information is not usually included on the packaging, so squeeze the mattress at the edges and center to test its firmness. The ticking (mattress cover) should be sturdy, waterproof and hypoallergenic. Double or triple laminate layers. Reinforced with nylon for waterproofing. Alternatively, consider a waterproof crib mattress cover. Anti-microbial layer to slow the growth of mold and bacteria. Hypoallergenic or organic layers, to protect your baby's fragile respiratory system. Many older crib mattresses are flammable. If the crib mattress is fire-resistant, remember that the fire-retardant chemicals begin to react with household fungi (such as mold) to emit dangerous gases as the mattress ages. Mold can grow in aging synthetic crib mattresses. Bacteria can fester on the surface from spilt liquids. If you are planning to convert your baby crib into a toddler bed, dual firmness convertible crib mattresses are a good idea. Firm for infants on one side and cushier for toddlers on the other, you can flip the mattress sometime during baby's second year. Make sure to send in your product registration card. This will ensure that you are notified in the event of a recall. To prevent microbe growth, keep your baby crib mattress clean by wiping it down with soap and water after any accidents. The baby crib mattress should have a border rod to protect the longevity of the mattress. The crib mattress should have adequate venting. Vents keep the mattress smelling fresh by allowing odors to escape. The more vents, the better. The baby crib mattress should be a snug fit. By law, all full-size crib mattresses must be at least 27 1/2 inches by 51 5/8 inches and no more than 6 inches thick. However, check for yourself to make sure that the mattress is the correct size for your baby crib. If you can squeeze more than two fingers between the mattress and the baby crib, the mattress is too small and poses an entrapment and suffocation hazard. Read more about crib mattress safety here. I cannot stress strongly enough, my recommendation that you consider using a natural baby crib mattress for your baby. Remember that the chemicals released by a synthetic baby crib mattress, have been indicated as being among the possible causes of SIDS. Please be aware that the baby crib mattress information provided by Creative Baby Nursery Rooms is for the purpose of helping you to decide on the best mattress for you. Upon making your choice, it is your responsibility to ensure that your preferred baby crib mattress adheres to the CPSC standards in crib safety.